Living in tight-knit communities in southern Milwaukee, West Allis, and Cudahy, Milwaukee Slovenian immigrants constructed an assortment of churches, fraternal orders, and cultural institutions that preserved their traditions while they also adapted to America. The earliest Slovenes arrived in Wisconsin in the 1870s when Slovenia was part of the Austro-Hungarian Empire, and the migration continued into the early twentieth century. The majority settled in the Milwaukee area, with smaller migrations to Sheboygan, Kenosha, or more rural regions in Northwestern Wisconsin. The Patrick Cudahy meat packing plant and Allis-Chalmers Corporation both employed many Slovenes, as did Pfister & Vogel and other tanneries in Milwaukee. Based on an individual’s mother tongue, the number of foreign born Slovenians residing in Milwaukee totaled between 2,000 and 3,000 between 1910 and 1940. Slovene immigrants settled in geographically-specific areas of Milwaukee and West Allis, as evidenced by the location of many of their business, cultural, and religious establishments. In Milwaukee, for instance, Slovenians lived near Sixth Street and National Avenue and at Ninth and Mineral Streets. The latter served as the location of St. John’s Catholic Church, the main religious center for Slovenes. Milwaukee’s first Slovenian church was built in 1908 as St. Mary’s Help of Christians at Sixty-Second and Madison Streets in West Allis. 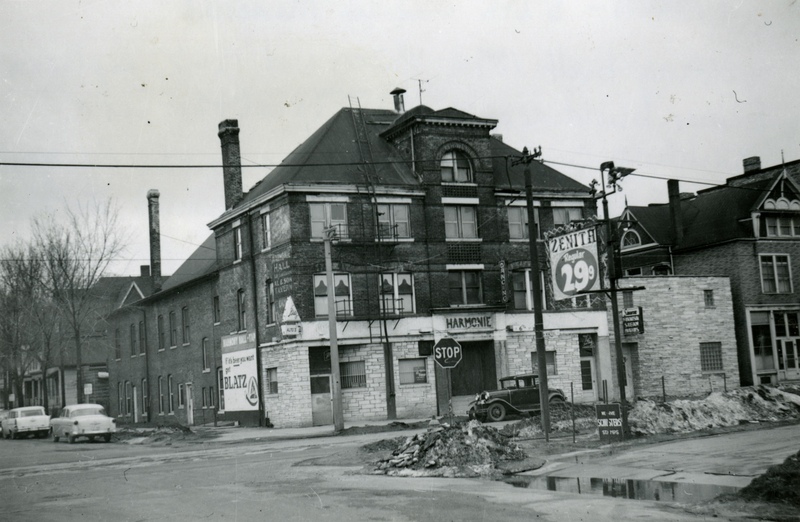 Slovenes also opened various recreational and social clubs near Sixth Street and National Avenue, including South Side Turn Hall, Harmonie Hall, and Llidia Hall. Lily Lodge was a Slovenian establishment created in 1912 as a place for single men to congregate. This lodge, as well as many others, joined the Slovenian National Benefit Society, which, beginning in the mid-1950s, owned a tavern with a hall and a large (20 acres) plot of land (Arcadian Park) near 136th Street and Greenfield in Brookfield. Dinners, dances, and picnics, along with other forms of entertainment, were held at this location. Like many immigrant groups, Slovenes faced economic difficulties upon their arrival in Milwaukee and West Allis, and they responded by forming a fraternal organization known as Sloga (Unity) in 1908 on Milwaukee’s south side. The lodge collected money for Slovenians who could not afford to pay for medical care and the costs associated with burials. More than 100 Slovenians made up the lodge in Milwaukee, which, after numerous name changes, became known as the Sloga Fraternal Life Insurance Society and existed under this name until 1994. During this time, the Sloga also provided mortgage assistance, helped with the cost of attending college, and held cultural and sporting events. After World War I, Slovenia became part of Yugoslavia. It gained its independence in 1991. By the end of the twentieth century, persons of Slovenian ancestry living in Wisconsin totaled around 4,000, with the majority living in Milwaukee and Waukesha. In 1982, the University of Wisconsin-Milwaukee Peck School of the Arts received a bequest that allowed for the creation of the Slovenian Arts Program. Working in tandem with that program, the Slovenian Arts Council organized concerts and performances. In the late 1990s, the UWM library reached an agreement whereby all of the scores housed at the Slovenian National Ethnomusic Archive would be copied for UWM, making library’s Slovenian Music Collection a significant resource for musicians and scholars alike in North America. Begun in 1932, the Fun-O-Leers Club remains a Slovenian ethnic club and holds various charity and holiday events. ^ Marie Prisland, “The Slovenians, Most Recent American Immigrants,” Wisconsin Magazine of History 33 (March 1950), 271; Kazamierz J. Zaniewski and Carol J. Rosen, The Atlas of Ethnic Diversity in Wisconsin (Madison: University of Wisconsin Press, 1999), 94-95; Christine M. Ermenc, “Going Back: A Journey to Slovenian Milwaukee,” Historical Messenger 32 (Autumn 1976): 91. ^ James Sebanc, “Immigration and the Emergence of Yugoslav Social Communities in Wisconsin, 1900-1971” (Master’s Thesis, University of Wisconsin-Milwaukee, 1972), 104. ^ Ibid., 109, 135, 130-132. ^ Wisconsin Historical Society, “Sloga Fraternal Life Insurance Records, 1908-1994, 2008: Biography/History,” accessed October 17, 2014. ^ Zaniewski and Rosen, 94-95. ^ “History of the Slovenian Arts Program,” http://www.slovenianartsprogram.org/website13.html, accessed November 17, 2014. ^ Peter G. Watson-Boone, “Innovation in International Library Programs: The Slovenian Music Collection at the University of Wisconsin, Milwaukee,” College and Research Libraries News 62 (December 2001): 1091. ^ “We Are the Fun-O-Leers,” accessed November 17, 2014. Ermenc, Christine M. “Going Back: A Journey to Slovenian Milwaukee.” Historical Messenger 32 (Autumn 1976): 88-100. Prisland, Marie. “The Slovenians, Most Recent American Immigrants.” Wisconsin Magazine of History 33 (March 1950): 265-280. Sebanc, James. “Immigration and the Emergence of Yugoslav Social Communities in Wisconsin, 1900-1971.” Master’s thesis, University of Wisconsin-Milwaukee, 1972. Watson-Boone, Peter G. “Innovation in International Library Programs: The Slovenian Music Collection at the University of Wisconsin-Milwaukee.” College and Research Libraries News 62 (December 2001), 1090-1092. Zaniewski, Kazamierz J., and Carol J. Rosen. The Atlas of Ethnic Diversity in Wisconsin. Madison: University of Wisconsin Press, 1999. In 1949, the first group of post-World War II Slovenian political refugees arrived in Milwaukee from Austria and Germany, after escaping the Communist Revolution of 1945 in Yugoslavia (Slovenia). In 1952, these immigrants formed the Triglav Slovenian Cultural Society. In 1961, the Society purchased 15 acres in the Town of Norway in Racine County, and established Triglav Park. Every summer public picnics and other community events are held there. The St. John’s Catholic Church at S. Ninth St. and Mineral was demolished in 1965 due to freeway expansion (National Ave. entrance ramp). The St. John the Evangelist parish, along with some of the Slovenian parishioners, then relocated to newly-constructed facilities in the expanding suburb of Greenfield.